Under its ambitious plan of covering a wide spectrum of transportation services, cab-aggregator Ola plans to launch bicycle sharing, and is running a pilot on the IIT Kanpur campus. Ola Cycle Pool Services or Ola Pedal comes on the heels of a number of other players, including self-drive car rental firm Zoomcar and the newly-founded Yulu, entering the app-based bicycle sharing business. Zoomcar is providing its services in select cities right now. Ola launched its bicycle sharing service on the IIT Kanpur campus on November 2. It added a ‘Pedal’ button on its app to allow students, faculty and others on the campus to avail of bicycles on rent. The service is free for the first 30 minutes and a charge of Rs 5 will be levied for every half an hour thereon. 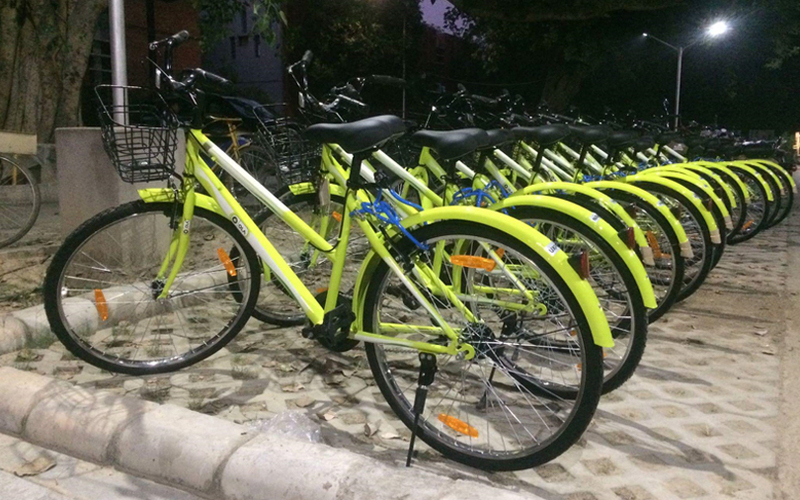 Those who book bicycles on the app will be provided a code, which they can use to unlock the service, according to an IIT Kanpur student community Facebook page. The company put out around 600 bicycles, while another set of more sophisticated bicycles with GPS, QR Code and smart locks are on their way to the campus, the student senate informed its community on its Facebook page earlier this month. IIT Kanpur offers Ola a testing ground as faculty and students are avid bicycle users. The institution has long banned motorised vehicle movement on the campus spread across 1,200 acres. According to several people in the know, Ola has been stealthily working on the bicycle sharing project since the start of this year but certain other initiatives such as electric car fleet took precedence. Besides its taxi cab service where it offers on-demand short distance conveyance in hatchback, sedan and luxury cars, outstation trips and rental, Ola currently has a bus service under Ola Shuttle, a two-wheeler service under Ola Bikes, and a three-wheeler taxi service under Ola Auto. It is expanding its electric car fleet too. The persons cited above said that Ankur Nyati, senior director and business head at Ola, will head the bicycle sharing business. Instead of publicly launching the service, Ola seems to adopt the strategy of going to large college campuses and IT parks where motorised vehicles are not allowed. The company also has plans to launch the bicycle service in Manipal University, they said. Two days after VCCircle reported this story, the company confirmed its entry into bicycle-sharing. "We are piloting Ola Pedal in various campuses, to begin with," an Ola spokesperson said. "We are seeing massive interest in Ola Pedal from campuses and cities across the country, and are working on expanding the scope of this offering in the weeks ahead," the spokesperson added. Ola, the leading homegrown startup backed by SoftBank, Tiger Global and Tencent and others, recently raised $1.1 billion from investors and is on course to raising $1 billion more. The fresh infusion of cash allows it to expand its businesses and take up a few experimental projects. Ola enters this business, which is still untested on a large scale in India, when several cities including Ujjain, Bhopal and Chandigarh have called for tenders for bicycle sharing systems. Even as the country slowly warms up to the digitally managed bicycle sharing service for last mile conveyance, perhaps inspired by the popularity of this model in neighbouring China, at least a couple of companies have already stepped into this business. Ford- and Sequoia Capital-back self-drive car rental company Zoomcar was the first one to launch an app ‘PEDL’ and plug that on to its tech platform. Its founder Greg Moran said the company already put out around 3000 cycles in select locations in Bangalore and Chennai and has plans to take this to at least 10,000 across 20 cities by the year end. InMobi co-founder Amit Gupta who recently stepped down from his executive role at the ad-tech company launched Yulu Bike Private Ltd with three others. The company is planning to start operations soon. * This article was updated to include the company's response.